Peter Wilmoth finds a snow trip provides plenty of chances to bond with the teens. I found a way to sit with my teenage son and (almost) teenage daughter and talk to them for 11 hours about a wide range of topics with no hand-held device involved. I know, you're thinking - how did I do that? Here's how: pack a car with warm clothes, hop into it at 4.20am and drive towards Falls Creek. And you tell the teenagers that the hand-held device is not for movies today but for helping Dad find Falls Creek. Majestic setting: QT Falls Creek. Anyone who's a sole father with two kids knows what I'm talking about - getting facetime, or eartime - with your teenagers isn't any easy task. Over seven years we - the gang of three - have had hundreds of meals and conversation opportunities. But there is something about having nowhere to rush to after dinner, no Modern Family on TV, no afl.com.au to head to. Instead it's a lot of time together, in a car, in the gloom of a winter pre-morning, all excited about where we're going. I used to be reasonably interesting to my kids. Now, trying to compete with the massively attractive world of social media means your stories, anecdotes, jokes and general banter need to be sharpened and refined if you're to drag their little eyes away from a screen, even for a moment. I'm joking of course. But am I? Why am I so thrilled to have ranged across conversations that included the wonders of the Eurostar train my son one day wants to take from London to Paris, why being able to speak French can be useful, the benefits or otherwise of a player leaving your AFL club, and memories of some holidays the kids and I previously took, just the three of us. For me, being a sole parent, chatting opportunities are golden. And you never know when you'll discover that gold. As we drive through the dawn, we talk the whole way. It's not the first time I've done this. 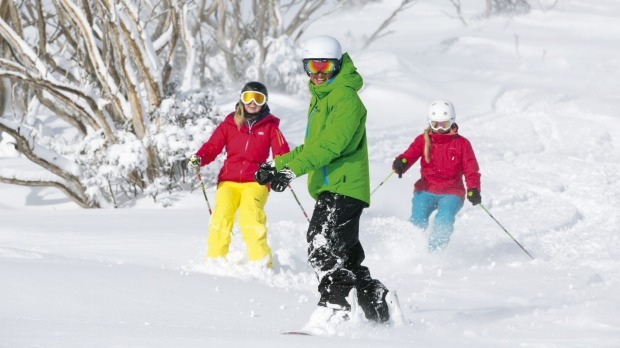 A few years ago when I was about to be a single father and the kids were seven and five, I had the cockamamie idea that I would take my two kids skiing to Mount Buller. I look back on that decision with a mixture of wonder at my audacity and amazement that we're still not sitting half way down some mountain, a kid refusing to move out of understandable fear. Back then I used the lure of football cards to bribe my son onto the obviously intimidating chair lift. (Bribery is the most under-rated of a parent's armoury of persuasion techniques, often more effective than reason, logic or begging). We've skied seven times since. They're now 14 and 12, so we thought we'd do it again. Seven years since that first day on Mount Buller certainly no inducements are needed to entice them onto this chairlift. From Melbourne it's a five-hour trip and from Sydney seven hours, so as far as bonding opportunities go, it's right up there. And we head towards the best snow in 10 years. We pick up chains at Ray's Ski Shop in Myrtleford, a couple of hours before Falls and arrive in the village at 10.30. No doubt it's a long drive, but there is something strangely adventurous about coming so far and then seeing your reward on arrival. Snow. Lots and lots of it. Falls has been blessed with more than a metre of snow on our visit and there's an excited buzz on the mountain. We start with the family-friendly Wombat's Ramble before moving on to the slightly more challenging Drover's Dream and Highway 83 and then Last Hoot and Milky Way. The three of us adapt quickly and apart from some sore quads make it through day one nicely. Both the kids are skiing well. It's a thrill to ski at full clip behind the kids who just a short while ago were paddling around on Buller's lowest reaches. Now they're flying. As a father it's wonderful to watch as the skiing addiction bites. You see the exhilaration on their faces and the satisfaction of them improving with each hour on the mountain. And you get to sit in the chairlift with them. They are now truly a captive audience. Up here, skis dangling in the sky, there ain't nowhere to run from yet another chance of conversation, fatherly observations and even some dad jokes. I bookthe kids into a private lesson. They have a ball, learn some good techniques and develop confidence. This is my chance to test my own progress. I meet up with Mark, an instructor, who takes me to some more challenging runs. The company of an expert when you're a once-a-year skier is priceless. Mark takes me where I wouldn't have known where to go, including some challenging black runs. We ski down Cloud Nine, across to Powder Keg and then over to the bottom of Ruined Castle and then out for some afternoon powder on Boomerang, back down the inside of the south face, up the Ruined Castle lift and down Racecourse and to the Summit, a black run, skiing the Slot, the Knolls and down Lakeside and down Cloud Nine. I know all this because I asked Mark later and taped his response. All I really knew was I'd had an exhilarating afternoon and a chance to see how Falls differs from other mountains in its scope and scale: it's renowned for its wide open runs and spectacular views. We ski some moonscape-type runs, carving through new dry powder under a dazzling sun. It is only just off-piste but it seems remote enough for me to give the mobile phone in my ski jacket a bit of a pat as Mark skis off. It's been a wonderful four days on the mountain skiing with the kids and a reminder, if one is needed, to never underestimate the preciousness of time with them. Our trip put me in such a great mood I'm even looking forward to the five-hour drive home. After all, there is so much left to talk about. The writer was a guest of Falls Creek, QT Falls Creek, spaQ, Elk and Winterhaven. Falls Creek is about five hours from Melbourne and about seven from Sydney by car. QT Falls Creek. 17 Bogong High Plains Road, Falls Creek. Sitting at the base of the mountain's main runs, the QT has excellent ski-in, ski-out accessibility. One, two and three-bedroom apartments are available, starting at $698 a night for the one-bedroom in peak snow. From the shoulder season that price is halved. See fallscreek.com.au/qtfallscreek. Winterhaven Restaurant and Bar: Chalet-style cosy dining and excellent service. 28 Slalom Street. Elk: Tables are focused around a roaring open fire. 18 Slalom Street. 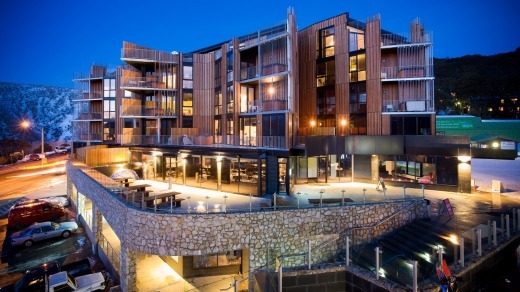 Bazaar restaurant at QT Falls Creek: An "interactive marketplace", where you can choose from a dazzling array of food, or ask a chef to make to order. 17 Bogong High Plains Road.